Take this Pre-test now. If you answer 90% or better of the 50 items correctly, buy the book for a friend. You probably don't need it. Order book from Amazon.com or Lippincott W&W. Directions: For each of the following ten numbered statements or questions, there may be none, one, or more than one correct response. Circle the correct letter response(s) before checking the answers in Appendix B.
b)	has excess alveolar ventilation for the amount of CO2 production. c)	must be breathing faster than normal. d)	must have acute respiratory alkalosis. e)	has reached a new steady state for gas exchange. 2. Which of the following statements about PaCO2 (arterial PCO2) is(are) true? a)	PaCO2 is directly related to the rate of CO2 production, and inversely related to alveolar ventilation. b)	If PaCO2 goes up, while the inspired air remains unchanged as to pressure and oxygen percentage, PaO2 will go down. c)	Even when PaCO2 is above 120 mm Hg, it is possible to maintain a normal arterial oxygen saturation with inhaled supplemental oxygen. d)	In patients with lung disease, useful bedside parameters for determining whether PaCO2 is high or low are respiratory rate and mental status exam. e)	To reach the summit of Mt. Everest (barometric pressure 253 mm Hg) without supplemental oxygen and survive, one must keep PaCO2 below 20 mm Hg. b)	ventilation-perfusion (V-Q) imbalance with an increase in the number of low V-Q units. c)	increased PaCO2, while the subject is breathing room air. 4. Which of the following sets of values would be helpful in assessing the acid-base state of a patient's blood? 5. Which of the following statements regarding acid-base balance (is)are correct? a)	HCO3- increases with acute elevation of PaCO2, before any renal compensation takes place. b)	A patient can have metabolic acidosis and metabolic alkalosis at the same time. c)	A patient can have high-anion gap metabolic acidosis and hyperchloremic metabolic acidosis at the same time. d)	An anion gap 20 mEq/L is presumptive evidence for metabolic acidosis unless proven otherwise. e)	In theory, the bicarbonate value calculated from the Henderson-Hasselbalch equation and the serum "CO2" value measured with serum electrolytes in venous blood should be identical. 6. The following statement(s) about PaO2 (arterial PO2) is(are) correct. a)	In the absence of any right-to-left shunting of blood, PaO2 is determined solely by the alveolar PO2 and the interface of the alveoli and pulmonary capillaries. b)	PaO2 is the sole determinant of SaO2. c)	Oxygen molecules chemically bound to hemoglobin do not exert a gas pressure. d)	In a mountain climber with normal cardiopulmonary system, the decline in PaO2 with increasing altitude is solely attributable to the fall in barometric pressure. e)	The PO2 in a cup of water open to the atmosphere is always higher than the PaO2 in a healthy person (breathing room air) who is holding the cup. 7. The following information, including numerical values and units, is accurate and/or useful when determining a patient's arterial oxygen content (CaO2). a)	Each 100 ml of hemoglobin can combine with 1.34 ml of oxygen. b)	Normal CaO2 is between 16 and 22 mgm/dl. c)	Normally, dissolved oxygen constitutes less than 2.0% of the CaO2. d)	Normally, mixed venous oxygen content at rest is about 25% less than CaO2. e)	A 10% decrease in SaO2 will produce the same percentage decrease in hemoglobin-bound oxygen content as will a 10% decrease in hemoglobin content. 8. 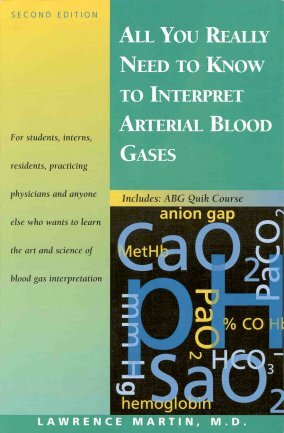 Arterial blood gas data (pH, PaCO2, PaO2, SaO2) are related in some simple but important ways. Which of the following are valid relationships? a)	Alveolar PO2 is related to PaCO2 by the alveolar gas equation: as PaCO2 goes up, alveolar PO2 goes down. b)	PaO2 is inversely related to blood pH: as pH goes up, PaO2 goes down. c)	If PaCO2 increases while HCO3- remains unchanged, pH always goes down. d)	PaO2 is related to SaO2 on a linear scale (i.e., a straight-line relationship). e)	The SaO2 is related to hemoglobin-bound arterial oxygen content on a linear scale (i.e., a straight-line relationship). a)	"Hyperventilation" and "hypoventilation" are clinical terms, and are not diagnosed by arterial blood gases. b)	The alveolar-arterial PO2 difference increases with age and with increase in the fraction of inspired oxygen. c)	The arterial PO2 cannot go above 100 mm Hg while breathing room air at sea level. d)	A continuously negative alveolar-arterial PO2 difference is incompatible with life. e)	If arterial pH is normal, the patient cannot have a clinically significant acid-base disorder. a)	In the presence of excess carboxyhemoglobin the pulse oximeter will give a falsely high reading of oxygen saturation. b)	The pulse oximeter requires a detectable pulse in order to measure oxygen saturation. c)	In the hemodynamically-stable patient, the pulse oximeter is equal in accuracy to the co-oximeter. d)	The end-tidal PCO2 is usually equal to or higher than a simultaneously-measured PaCO2. e)	End-tidal PCO2 can be used to determine restoration of circulation during cardiopulmonary resuscitation.